Ann and Pat each work long, hours. Ann manages the kennel; Pat is a lost wax engineer for a major foundry. Ann enlisted Laura at once last week as Personal Assistant. They made a shopping list for cookies and meals for a week, and the PA was left mostly to her own devices. Laura is the cook here at Dale 23, and a stubborn little cook. She believes Pinterest and Mr. Google only. No suggestion of mine ever has been entertained, though my three edicts remain: neither soy nor Worcestershire will be an ingredient, and there will be a vegetable with every supper. And we rub comfortably along. Ann, however, is a person of awe. Laura has heard about her for years. Grandma has slipped up to Wisconsin once or twice a year for most years Laura has known. Ann must be a real force in the universe. Not to mention, Ann taught Grandma to make Burning Love, one dish Laura serves because she confirmed it on the internet, and it is good. Laura was tasked with Christmas dinner, turkey and trimmings. Her expertise was limited to mashed potatoes. She swallowed hard and forged on, with Ann’s instructions. An entire drumstick, the chief cook's reward. And cranberry sauce to dress a week of leftovers! And for John, Scotch eggs at a restaurant on the way to the airport. In Wisconsin they are made with bratwurst and served with mustard and sauerkraut. Good. You made out like a bandit Joanne. I wish I could get someone to cook for me. The scotch egg sounded good. I've never had one. Dear Joanne, I'm so glad I read the posting preceding this one and learned about Pat and Ann. I'm not surprised that Laura listened to Ann about the cooking. Somehow others have more authority than those nearest and dearest such as yourself. The meal must have tasted delicious! Peace. The only thing wrong with the trinity is the celery. I feel about it like you do about Brussel sprouts. Wow! I think Laura did a fantastic job of preparing the dinner and she will feel so good about having done it. I know countless women who (and men) could not pull off a dinner on their own. It is a lot of work to feed a small crowd. I had scotch eggs once and I enjoyed it but never had it again as they are not that common here and I never made one myself. You sound like you had a wonderful time and I'm glad you are safely home. Yum. Your Christmas dinner sounds good. 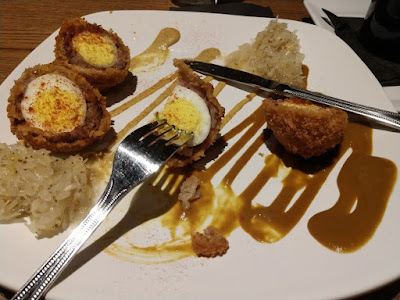 I haven't been able to get a Scotch egg since leaving the UK. How great that you've them out in your neck of the woods. Anything served with Sauerkraut and mustard can't be beat. Looks like Laura did a great job with Christmas dinner! As for the trinity... ours is onion, bell pepper, and garlic. And I have heard of scotch eggs, but never tried one. I think they have them at the Renaissance Fairs. Yay, Laura. You are turning into a great cook! It all sounds delicious! You are a very proud grandma, and deservedly so. How many teenagers of today could produce such a lovely Christmas meal? Very few. Everything said above is resounded here....with the exception of soy and Worcestershire sauce. Alas, we can't agree on all, eh? I use both in liberal amounts, soy particularly, in everything from gravy onwards to beans, and the Worst' and sauce in many other things. That's how it goes, eh? It's the salt, Mike. I like my BP at 90/60. But it was a great dinner. Cheers. 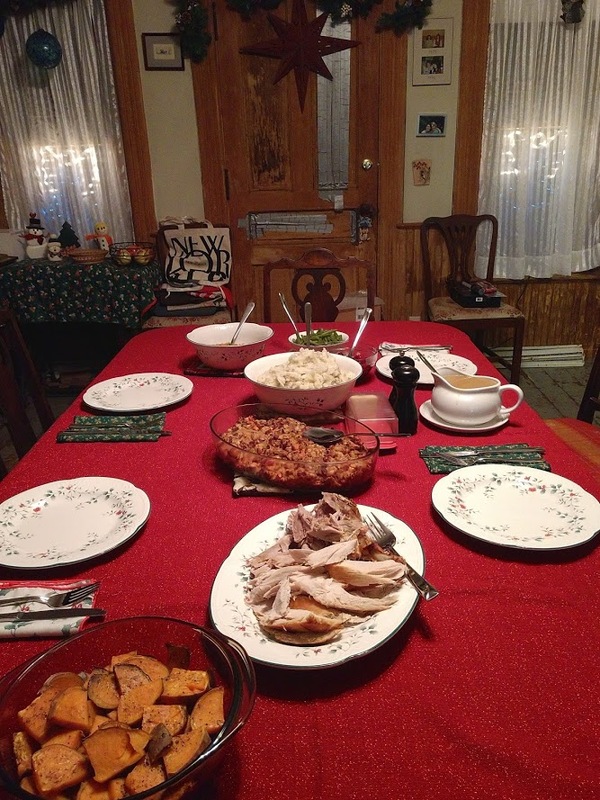 It's a big deal to cook Christmas dinner, even part of it, and especially the turkey. 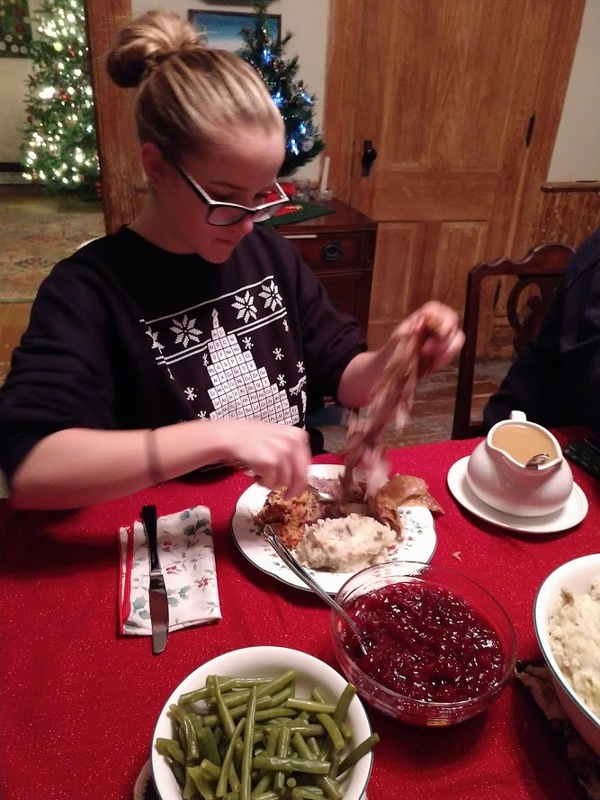 I'm truly impressed that a teenager accomplished a meal that nice. You must be bursting with pride! 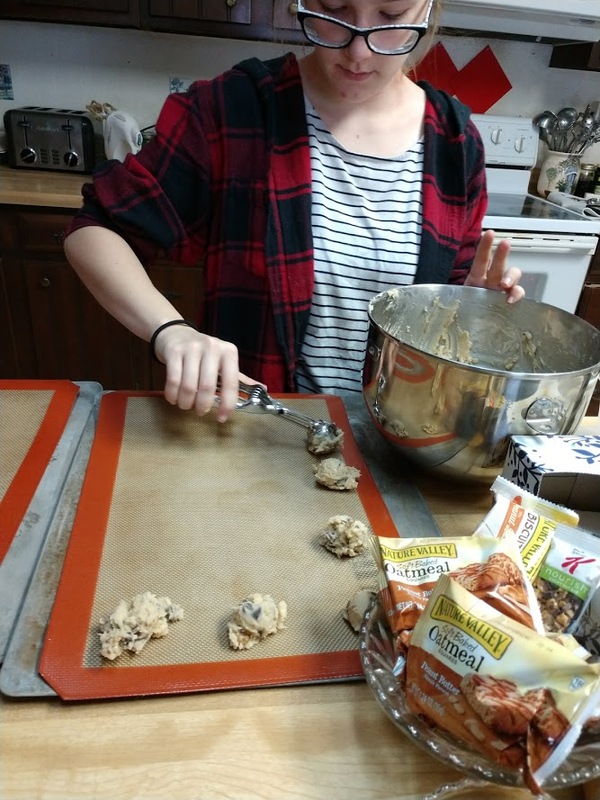 Yay for Laura, having the courage and the fortitude to perserver and cook an entire Christmas dinner. An accomplishment which will never be wasted. Sprouts were christened 'baby garbages' by my father and were not served. Yay. My mother boiled them to a nasty grey slush. And bless her heart many years later told me I couldn't be a vegetarian because I didn't like them. She was wrong. She has a fierce desire to do things independently and well. I stay back unless disaster looms. She will take advice from people for whom she does not want to fail, like Ann. She's an interesting child. So it was your Scotch Eggs which made it to Santa Cruz. Cook's Trinity indeed. There's not a single winter when my kitchen doesn't contain all three all the time, often joined by garlic. Cranberry sauce is nice on turkey sandwiches. Burning Love? More detail please? Slowly fry diced bacon slices to nice crisp. Drain and set aside. In drippings, saute onion and garlic. When seer, add bacon back to rewarm. Serve in a well in mashed potatoes. Single servings among all college friends gathered for a Saturday evening. Ann learned to make it in college in Switzerland. PS--lots of onion and plenty of garlic. lots of onion and plenty of garlic is standard around here, but I'll try this and pass the recipe to my two youngest who will try anything. They go through a half dozen garlic bulbs per week, with cheesy garlic mashed potatoes being a winter favourite. I'm so impressed that Laura made such a fine meal. my trinity would be celery, onions, and garlic. carrots seem an odd choice to me. I'm so impressed with Laura. 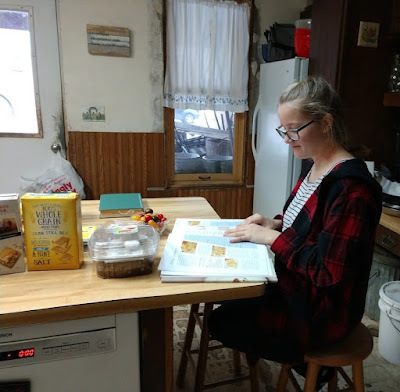 Could not get my daughter interested in learning how to cook. well, done Grandma. Mine had to, in order to eat, and switched weeks through jr. high and high school. The competition was jealous and fierce: "Mom likes my xyz better than yours!" The oldest went on to own an award winning restaurant for years. That is a VERY impressive looking Christmas feast! But ugh, I'm with you on Brussels sprouts. Glad you were able to escape them. There are different trinities in different places....Many have no carrots but do have bell pepper, for instance. But I think all have onion, and most also have celery. Lovely dinner! Hate brussel sprouts with this meal. Put them with corned beef or ham, but never with turkey! Yay for Laura! !